I enjoy journaling. Especially my thoughts when I study the Bible or spend quiet time with God. I can look back at things I've written in the past and it's wonderful to reflect on where I was at that point in my life. I also like to just journal my everyday life, funny things my children said, profound thoughts that were shared with me or to write down the words to a poem or song that has come to me. But I don't want to write in just any old notebook. I want a special journal. Something beautiful to look at just on the outside regardless of what is written on the inside. Typically I have used composition notebooks and covered them inside and out and made my journals that way. That works well. Plenty of pages and a decent size. Recently, however, I came across another resource for making journals. They are by Muji and are available on Amazon. The come five to a package, have 30 lined pages and measure 6 x 8.25. The front and back are just plain craft color but the spines are a variety of colors. Here are four of them. The last one has a lovely mustard yellow spine and I used it to create my latest journal. This is where the products from Silhouette America really shine. I printed a background color onto the Printable Cotton Canvas that has a sticky back and then adhered it to the front and back of the journal. I also used the Ribbon Slots Border item#7718 by Sweet Afton. Colored it with the fill color option and cut it out at well then wove some of Stampin' Up's Tangerine Tango 3/8" stitched satin ribbon through it. The phrase oval I is on printable canvas too again with the print and cut. The flower pattern is a picture I captured off the internet and turned into a cut file then did a print and cut of that using printable white sticker paper. The result was a journal with a beautiful look and an elegant feel to it. I really like that it's only 30 pages. One month of entries and it goes to the shelf and I can adorn and collect an entire library of these if I choose to. They would also make great gifts for someone heading off on a trip to journal their travels or for a bride to be to journal her wedding preparations. I have a dear friend turning 80 next month and we are going to surprise her with a party. Instead of gifts we decided to make her a Memory Book that everyone who comes can sign and then write a little something. There will be room for pictures too. I chose Photobooks & Individual Pages and then 8 x 8 square and Designer style. This gave me the option to choose a basic template that was already designed. All I had to do was make a few changes and print. I went through the pages and deleted any words I didn't want, added words I did want, rearranged some of the embellishments and added some more here and there and removed the black photo blocks leaving the white background to create places for writing and adding photos. The design I used is Floral District. I printed the design onto Whisper White card stock and cut off all but the left edge so that I had a margin where I could use my manual comb binding machine to assemble it. Then I added some embellishments cut out from Tempting Turquoise and Melon Mambo card stock with my Silhouette Cameo cutter. Using MDS made creating this project very easy and quick yet beautiful. 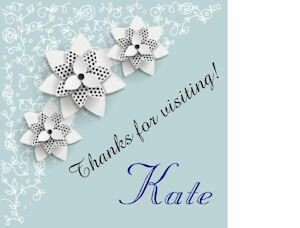 The Silhouette design I used is Circle Flower Frame #42102 by Jennifer Wambach. I resized it for my project and then after attaching it I used the Tempting Turquoise marker to add some accents to the leaves and stems which made them stand out better. I really like it. I can't show you all the pages, there are 22 of them but here are a couple more pics.